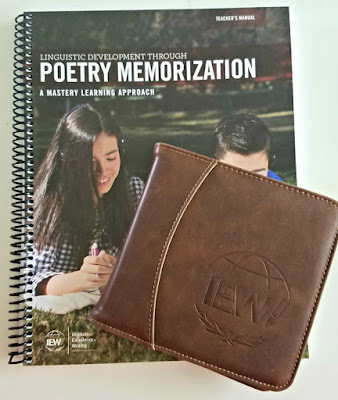 We have been loving using multiple products from Institute for Excellence in Writing, so when we were given the opportunity to review Linguistic Development through Poetry Memorization, we were all ecstatic! In many talks, Andrew Pudewa has gone into depth about how poetry can expand a student's vocabulary, infuse sophisticated English linguistic patterns, and be an enjoyable part of the day while helping create effective communicators. He expands on it all in the teacher's manual of the Poetry Memorization curricula. He explains not only the prerequisites for effective communication, but also what the importance is of memorization and why we use poetry. He further explains what mastery learning is and how to use this program and how it is set up. 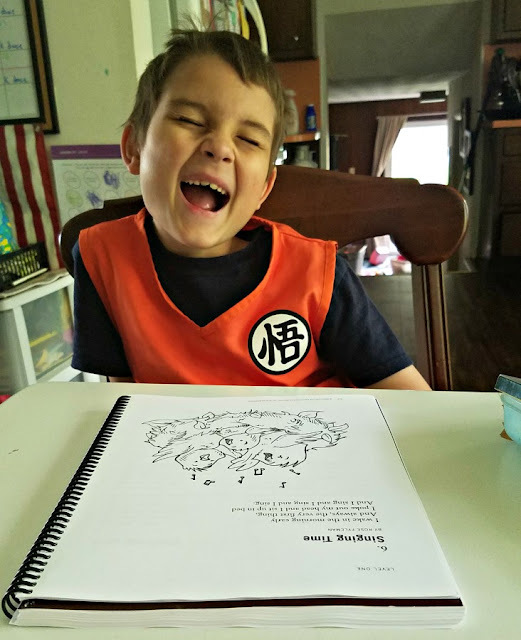 Because I am a Suzuki teacher, I have always understood the reasoning behind the decisions Mr. Pudewa makes in his curricula and the mastery technique in learning poems is exactly like how I teach songs in my lessons. There are five levels of memorization in this curricula. The first four levels are poems and the last level is speeches. It is recommended to start with level 1 no matter the age and to go through the levels in order, but to go at the pace of the student. For younger students it will take a lot longer to work through the poems. Older students will fly through some of the lower levels but will slow down as the poems get more intricate. It is expected that this curricula will take several years to complete. Each level has 19 poems to memorize and then the child gets to pick a poem on their own to be #20, which completes the level. I received the set that includes the Teacher's Manual and five CDs. The CDs are the poems, recited by Andrew Pudewa. 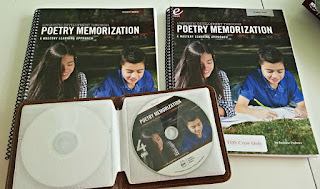 They are a great way to learn the poems for younger kids, but also a way to review and preview a poem with older kids. This set retails for $65 and includes a download link for the student book. The set also comes with a bonus DVD of Andrew Pudewa's conference talk Nurturing Competent Communicators. I was also given a physical copy of the student book which retails at $19. It isn't necessary since you get the download with the set, but I like having the physical spiral bound copy for my older student. Sebastian, age 8, having fun reciting some of the poems. He has been enjoying this curriculum. The kids can go at their own pace. So far my 5-year-old has memorized 4 poems and is working on the 5th poem of level 1 right now. My 8-year-old is currently working on the 7th poem of level 1. The poems are fun! Also, if you used IEW's PAL program, a few of the poems will be familiar to you already. There is a checklist of the poems to remind you to practice them every day! We have them hanging on the magnetic dry erase board. It has given me an opportunity to work on my 5-year-old's speech. We have been working on her r's and making sure she enunciates her words correctly. Honestly, there isn't anything we don't like about this program. Here are some videos of my kids reciting their favorite poem so far. They each picked a different poem from level one. You can see that at this point Sebastian was still working on that poem and Kaelyn has some diction we are working on.